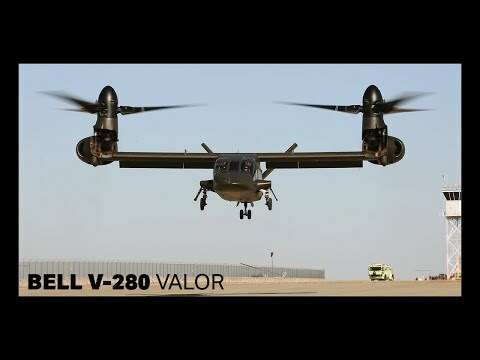 On Monday, December 18, 2017, the Bell V-280 tilt-rotor took to the sky under its own power for the first time, marking the milestone of first flight. No.. It's very important that it's 'bulletproff'. You don't want that to fail when you're in 'plane mode'. and a number of the first V-22 ospreys crashed when they first came out. I live very close to the north Texas Bell plant (not sure where the new V280 is made or test flown) but the regular civilian helos fly some type of transfer or test flights over our place during weekdays pretty low about every 30 minutes during daylight. The army used to train copter pilots of another nation on the Chinooks right down the interstate from a military base to a certain location 25 miles away every stinking day for a few years, we would see those also every day at same time. Lots of chinook pilots here too. The V-22 (and 280) are assembled just a few miles away and I expect to see the Valor flying around here soon. The Rick Husband/Amarillo airport southwest approach has become a tourist attraction because all kinds of private, commercial and military aircraft take off and land right over your head near the intersection of I-40 and Loop 335 where there are lots of restaurants and travel centers (truck stops). Travelers get caught up in watching the aircraft and the V-22 is a real crowd pleaser. Regarding Chinooks. If one of the rotors/engines fails.. Will they cut the working one, to get a stable autorotation? I think it can fly on one engine like the Osprey because the power trains are linked together by a shaft. if i was a designer i'll use 2 electric motors for rotors. and one engine-generator in the body. I'm sure the guys at Bell trade-studied the hell out of their options. That was probably one of them, but converting power from mechanical -> electrical -> mechanical is typically not a very efficient process, especially in an aircraft that you're trying to make as lightweight and fuel-efficient as possible. I would use one turbine engine and 2 rubber band back up motors. Rubber band motors have outstanding power to weight ratios and would provide enough power to get the helicopter stuck in a tree. by the way, two rotor scheme looks longitudinally unstable at low speed. they need +1 rotor at least on the tail.